Disney has their Marvel Cinematic Universe, Fox has the X-Men Franchise, and Sony has Spider-Man. But the thing that Disney and Fox’s superhero franchises have that Sony doesn’t is a self contained universe or cohesive storyline (no matter how sloppy the X-Men chronology really is). Sony had rebooted the franchise completely, leaving Sam Raimi’s version unfinished. So in attempts to make sure that doesn’t happen again, the studio made plans to make films until at least The Amazing Spider-Man 4. It has been rumored that these films would build up to the webslinger facing off against the Sinister Six and that fourth film would not be a traditional webslinger film in a sense, instead turning its attention to other characters in Spider-Man lore. One villain that immediately comes to mind is Venom, the alien symbiote (or monstrous creation depending on which comic arc you are looking at) that temporarily bonds with Peter Parker and enhances his spider powers, only to find a new host in Eddie Brock after Parker realizes how dangerous the symbiote really is. Brock would become Venom, a new threat to Spidey, but eventually would team up with him from time-to-time fighting other symbiotes like Carange. Seeing that Marc Webb’s Spider-Man is based in the Ultimate Universe, it likely that this Venom would be some sort of creative specimen made by Parker’s parents, thus continuing on the mystery established in the first film. As much as we’d like to see the alien suit, there may not be enough time to tell that story. In fact Josh Trank was hired to write a Venom treatment at one point in time. But plans for that stalled when Trank jumped ship to direct Fantastic Four for Fox. While it is clear what Sony wants to do, it’s hard to tell which characters they have a hold on. 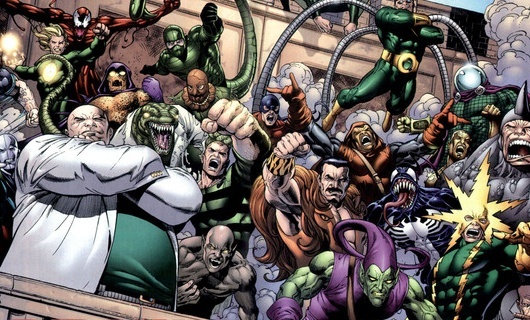 Though it seems obvious that Sony has the rights to characters like Eddie Brock, Ben Reilly (Scarlett Spider), Felica Hardy (Black Cat), and other villains in Spider-Man’s Rogue Gallery, characters like Kingpin may be with a different studio. No doubt that this move was made to stay in competition with studios with other Marvel properties, but would this move do to fans’ hopes of seeing a massive crossover in The Avengers 3?